The Society for Diversity is one of our clients that we’ve been managing for about 7 months now. When we started, they were converting only around 4 email subscribers per month, if that. Through strategic content analysis and writing, we’ve been able to increase that to an average of 14 per month and, sometimes, as many as 24! That’s an average increase of 300% in ROI! With their credentialing courses coming in at over $4,000 per sale, that’s an increase in revenue of $40,000 per month. You won’t be surprised to hear that data and trend analysis was the key. The problem with a lot of digital marketing companies is that they simply deliver content to client specifications. The client wants 2 blog posts per week on education, so that’s what they provide. The writing may be high quality, but that says nothing about whether or not it’s the kind of content that drives customer purchase behavior. You have to understand what the growth levers are for any business. That can come in the form of channels used, content developed, and relationships built. Same for SEO. Content might be written perfectly for SEO in mind, but if there has been no strategic analysis of what topics a company might actually be able to rank for in today’s overcrowded search engine world, it doesn’t’ really matter. Previously, the organization had done 0 tracking of their marketing efforts or sales results. It was thought that cold calls were driving most of the sales. However, we took the data of who had been called and compared that to who had ended up purchasing the program. We found out that only 1 person in an entire year had actually purchased after receiving a cold call! The sales staff simply thought sales were due to calls as many of the buyers rang to ask questions before purchasing. So, when sales staff thought about it, they remembered talking to people on the phone. But their recollections were entirely inaccurate. With an average of 15 hours per week making cold calls, it was an incredible waste of money and time. Key lesson, always track your results and regularly analyze your data for patterns. Your assumptions are often wrong. Then we found out that basically all purchasers were subscribers to the email list. Over time, the email list built trust by adding value and kept the organization front of mind. But it clearly wasn’t working well. With 6,000 subscribers, they were only converting at a couple a month. So what did we do to increase the conversion rate by 300%? Topic of blog post linked in newsletter. 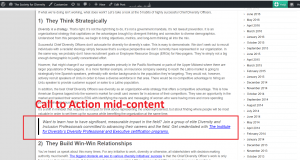 Another assumption was that a Sales CTA would lead to great sales. Again, this turned out not to be the case. There was no increase in sales after a CTA or drop when one wasn’t present. What we did find was that certain times of the year, such as September or January saw an uptick in conversions, but that was about it. So this wasn’t really enough to go on. The next place we went was the president of the organization’s LinkedIn blogs. She regularly used LinkedIn Pulse to blog on company related topics. We immediately found an increase in readership and engagement on posts dealing with leadership and business trends in the field of diversity & inclusion. So that seemed like one place to start. We then went to Twitter and starting monitoring conversations. 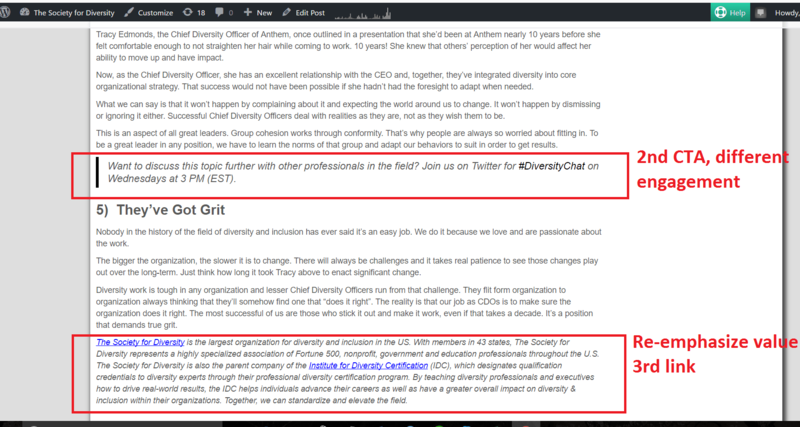 What were diversity professionals talking about online? Then, more importantly, what kind of content were they clicking through on? We starting sending out tweets related to relevant content. We found that 3 topics tended to drive clicks 1) Unconscious Bias, 2) How to Deliver Training, and 3) Metrics for Diversity & Inclusion. We also wanted to understand what connections there were between purchase behavior and other metrics. Not hard to guess this would be the case, but we saw that the more click-throughs there were to the blog post, the higher the sales volume. Obviously, the more people clicking, the more opportunities you have to convert someone into a customer. If you compare these two weeks below with the tracking chart further down, you’ll see that the week of 8/30 had just double the click-throughs compared to 9/9, but it made all the difference between a week with 0 sales and a week with 11 sales. Also, we made sure that the blog posts themselves included links to the purchase page. It’s not enough to just drive traffic to your website or build trust with great content. You have to show people what the next step is so that they can take advantage of the product or services you offer that will help them solve their problems. And don’t just give them one opportunity, provide several. Now we include a 2nd CTA with a different kind of engagement if the first didn’t appeal to them. It also allows us to further connect in real-time on Twitter. Then at the bottom, we re-emphasize organizational authority and provide a final opportunity to click and learn more. With all of the knowledge gained by listening, testing, and analyzing, we developed a specific content strategy that clearly appealed to our target audience and would increase click-throughs. And boy did it work. We jumped from an average of 1 sale per week to 5 or more. Two weeks had outstanding sales of 9 and 11 respectively, as you can see in the chart below. That was a 500% or more increase in sales each week! Here is January through June 2016. We started on the account towards the end of May. Here is July through November 2016, so as of last week. This clearly took a bit of time. It took a few months to build the data, test different kinds of posts, and really get into the heads of our audience. But, it was more than worth it. The most important thing to take away from this is avoiding a big mistake companies make, they think social media or content is about volume. Put enough out there and it’ll eventually peak enough people’s interest. This simply isn’t true. You actually need to spend as much time listening to your audience and tracking data as you do producing the content itself, whether that’s a social media post, blog, video, or newsletter.